First off, I did not run for 24 hours, nor was that the plan. In preparation for my 100 miler next month in Utah, I needed to get a 50 mile long run in. When my long runs move over the marathon mark, I try to find races that I can use as training runs. Having the aid and company of other runners is something I always welcome on longer runs. 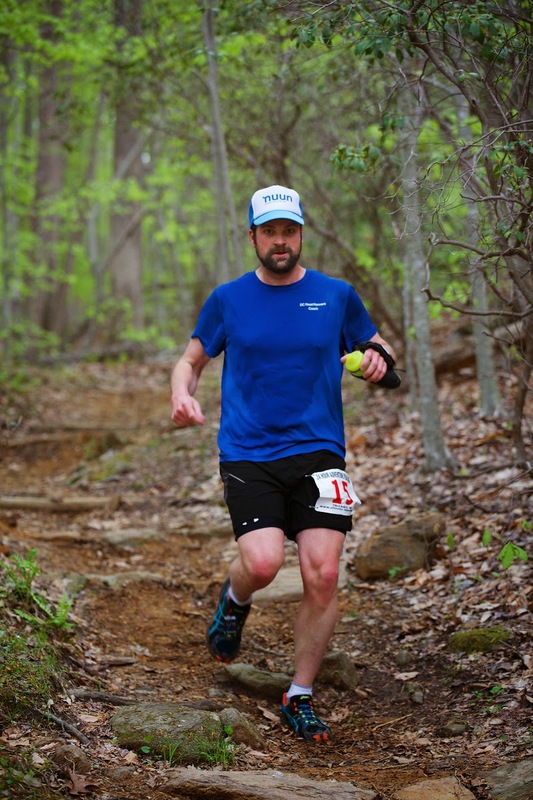 The 24 Hour Adventure Trail Run (ATR) fit perfectly with my training schedule. I had run ATR events in the past and enjoyed them very much. The race director, Alex Papadopoulos, does a great job organizing these runs and I knew this race would be no exception. 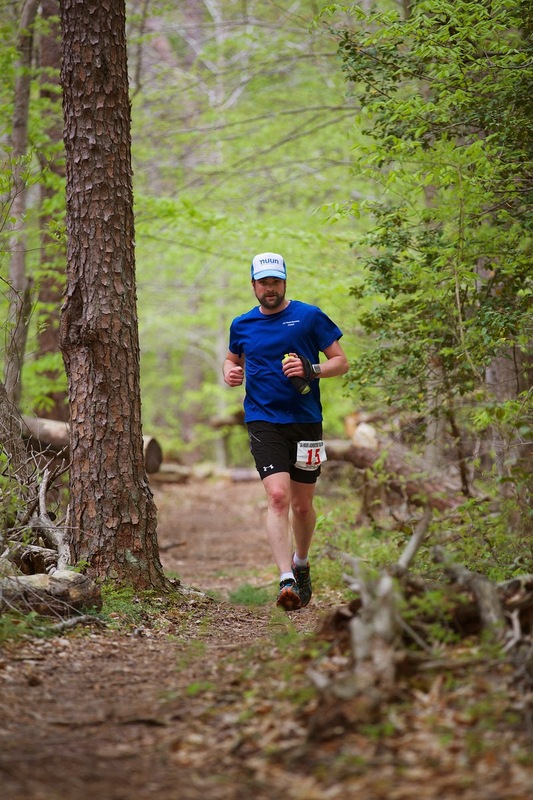 The race was also being held in one of my favorite places to trail run, Prince William Forest Park. Having run in Prince William many times, I knew what to expect in terms of trail technicality, which for most part is pretty non-technical. But, Alex did a good job sneaking in some tricky sections that kept me on my game, especially as the race wore on. The course was a 6 mile lollipop loop that incorporated a few of the trail networks within the park. For the first loop, we were told to run counter-clockwise. After that, it was up to us which direction we wanted to run. The loop had about 600 feet of gain/loss and Alex mentioned during the pre-race brief that one direction would be a bit easier to run than the other. But, he wouldn't tell us which. At 7am, me and about 75 fellow runners headed out into the beauty of Prince William Forest Park. It didn't take long for our small running pack to thin. About halfway into the loop there was an unmanned aid station that had two water coolers. One was filled with water and the other with Gatorade. Since I knew I'd be hitting aid every three miles, I opted to run with a handheld instead of my pack. Earlier in the week we had received about 2 to 3 inches of rain so I was a little worried about how the trail conditions would be. To my surprise, they were in great shape. The temperature was floating in the high 50s at the start with the day's forecast calling for patchy clouds and a high in the low 70s. While the temperature was comfortable, something I didn't take into account was the humidity. I noticed as I was finishing up my first loop that I was already sweating pretty good. I knew then and there that the key to having a good day would be to stay on top of my hydration. 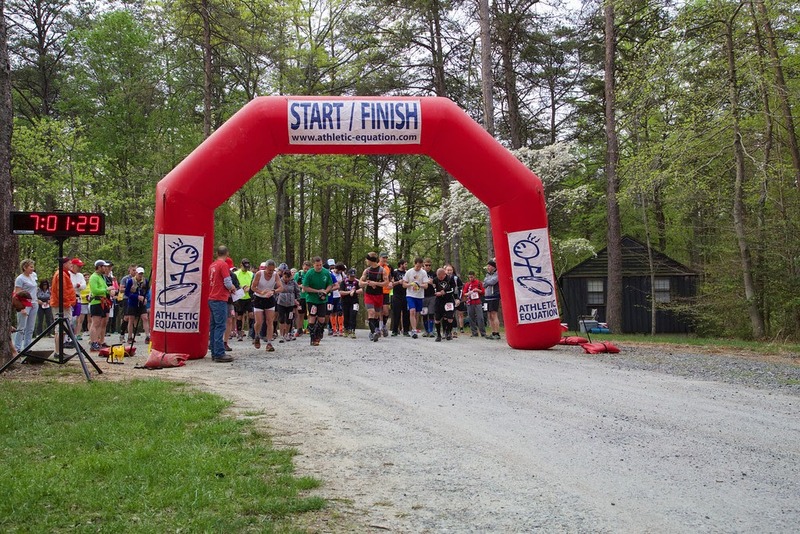 Right after you crossed the timing mats at the end of the loop, you entered a pavilion where the main aid station was. Next to the aid table were picnic tables were you could leave your drop bag. This set up made getting in and out of the aid station very easy. The volunteers were great. 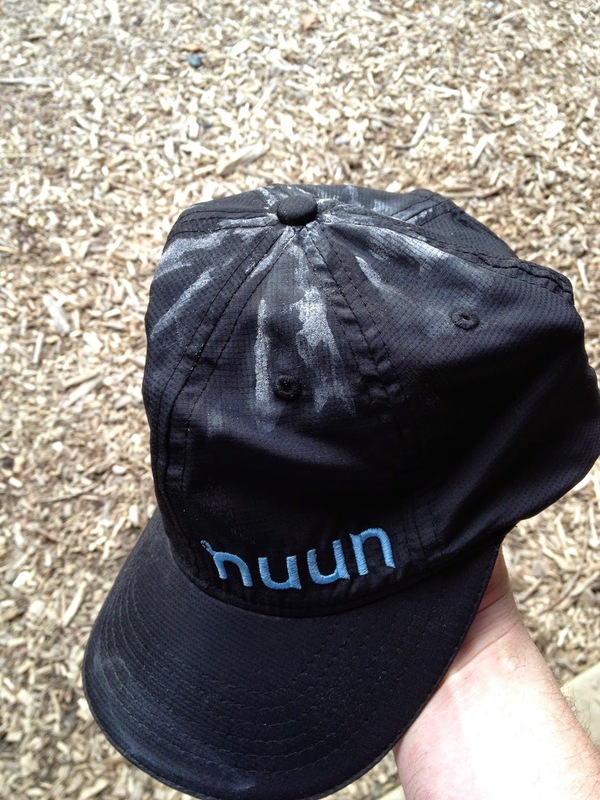 As soon as I would enter the aid station, they would ask if I needed anything. The aid table was stocked with all my ultra favorites; PB&Js, candy, cookies, chips, pretzels, soda. Throughout the day they would change up the menu with some other yummy treats like grilled cheese, pizza and these little potatoes things, similar to gnocchi, that were delicious. I ate so many of them! As I set out for my second loop, I opted to run clockwise. Spring had recently sprung and the trees surrounding the course were bursting with life. It was refreshing to see so much green after the prolonged winter we had. Part of the course (2.5 miles or so) was on my favorite trail in Prince William, South Valley. South Valley parallels a beautiful creek and I always enjoy hearing its sound in the background. With all the rain we received, the creek was a bit higher and flowing faster which only enhanced its peaceful tone. After completing my second loop, I felt that running clockwise was the better of the two directions, so I stuck with that for the rest of my run. Even though I was using this race as a training run, it's hard not to be competitive when you have a race bib attached to you. I was hoping to better my 50 mile PR so I wasn't holding back too much. I'm trying to become a better downhill runner, so I was really trying to pound down the descents. As the race wore on, I was feeling pretty good. But, judging by the slight headache I was starting to feel, I knew I was getting dehydrated. 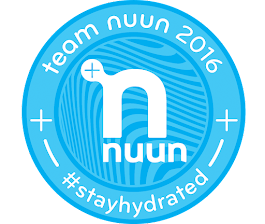 Dehydration is something I feel that I'm very vulnerable to because it doesn't take much for me to sweat...a lot. Even though I was drinking over 40 ounces of electrolytes every hour, it was hard for me to keep up with the amount of fluid I was losing. Each time I finished a loop, I would take in as much salt as I could. The aid station had salt pills (S Caps) that seemed to help in conjunction with my Nuun consumption. However, something I wish they had was just plain old salt. I know it might sound gross, but adding spoonful of salt in a cup of water does wonders for me when I'm dehydrated. The last 15 miles were the toughest. The end of each loop always seemed to last forever. 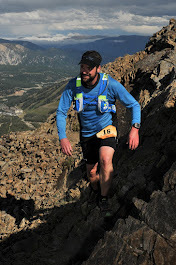 My energy level would start to get low and all I could think about was getting back to main aid station and restocking my body with salty goodness. My loop splits were getting progressively slower each lap, but that was to be expected as I took more time at the aid station towards the end. Heading out for my eighth loop I had completed about 43 miles. I felt surprisingly good during the first half of the loop, but as I reached mile 46 my body was starting to give in. The last 4 miles were more of a power hike than a run, but I didn't care. I was well under my previous best time so I knew I just had to get to the finish to lock up a new PR. I needed to add an extra mile in to get my 50. So, near the turnoff to head back to the finish, I ran off course and did my own little out and back to make up the difference. After I crossed the timing mats for the last time, I headed over to Alex to let him know I was done for the day. I had my 50 miles in the bag, my legs were spent and I was cramping pretty good from all the sodium I lost. I finished in 11:34:18, setting a new PR by 26 minutes! For the most part, I was happy with how my run went. However, I still need to work out the proper balance of food and fluid intake to maximize my running performance. Race or training run, I'm always learning something new. My thanks to Alex and the rest of the ATR crew for another great race. I had a blast! Congrats to all the other runners that ran some impressive distances.